South Korean superstar Lee Seung Gi is making the most out of his return after rendering military service. He hasn't had a rest day since his discharge, and is making sure his supporters get the most out of his fan meetings. "Let's not get separated and see each other more often from now on." 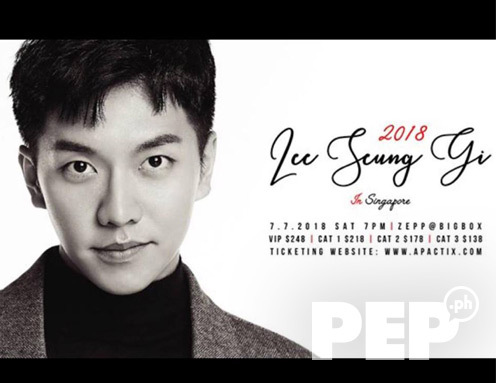 After five years, South Korea’s Triple-Threat Star Lee Seung Gi was back in Singapore last Saturday, July 7, for a grand fan meeting. Around 2,000 fans from different countries gathered to see the famous actor/singer/host. 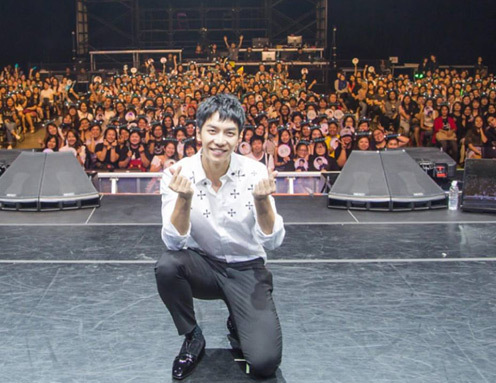 This writer was one of his Airen (the name, which means "The one I love" in Chinese, Seung Gi personally chose to call his fans) from the Philippines who flew for the second time to attend his 2018 fan meeting in Asia. The first one I went to was held in Bangkok, Thailand, at the Ultra Arena Hall @Show DC on April 8. This was his very first fan meeting after being discharged from military service last October 31, 2017. The Singapore event held at Zepp@BigBox in Jurong East, was his fourth this year. After Thailand, he also held fan meetings in Taiwan and Japan. On July 7, some fans were already at the venue early in the morning, even if the fan meeting was scheduled for 7 p.m.
Before we arrived at around two in the afternoon to secure our printed tickets, many fans had already lined up to avail the official Lee Seung Gi merchandise like LSG light sticks, cap with his signature, bag, pouch, key chain with his initials, and postcards. By the way, VIP tickets cost S$248 (or PHP9,528), while CAT tickets ranged from S$138 to S$218 (PHP5413 or PHP8,551). I saw some familiar faces from the first fan meeting. Some of LSG’s fans from Korea, Taiwan, Japan, China, Malaysia and Indonesia were also there. The general vibe of the whole lobby was really of excitement and anticipation, especially when the fans saw his Instagram post that he was already at the venue. Yes, I was there for the second time not as an entertainment writer but as one of his proud fans. When I first attended his first fan meeting, I thought that would be enough. But seeing him and experiencing him perform in person was like eating a famous brand of chips, once you pop, you can’t stop! It was two whole hours of fans personally interacting with Seung Gi. He thanked his fans in the English language at the beginning of the event. He also spoke Japanese to a lucky fan who can speak the Japanese language. FUN GAMES. The scene re-enactment of his most recent series Hwayugi: A Korean Odyssey was one of the evening's highlights. Oh Yeon-seo played the female lead character Jin Seon-mi or Sam-jang. Three lucky fans were chosen and the only guy was the one who re-enacted the blanket scene of Son Oh-Gong and Sam Jang (played by Oh Yeon Seo in the show), which made everyone laugh. Incidentally, the guy was there to accompany his girlfriend who’s the real fan of Seung Gi. 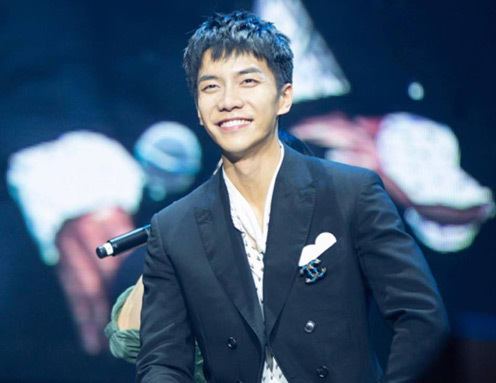 Another game was a relay game that involved doing sit-ups, saying "Seung Gi I Love You" while eating a lemon, throwing a ball in a basket, and doing 10 rounds in a hula-hoop. 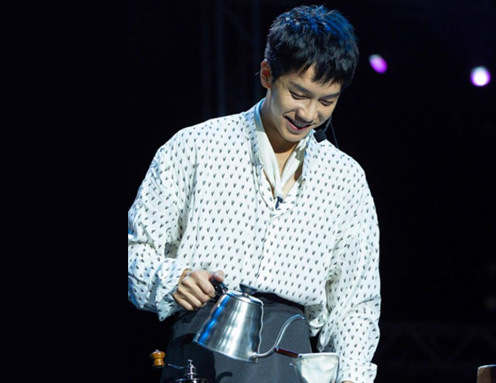 Seung Gi also chose his own Sam-jang among the fans, one with long hair, stands 167 centimeters or 5'4", wears a skirt, wears heels, with manicure, and someone who loves to exercise. He also showed his skill in making an Americano coffee. A lucky fan got to taste his dripped coffee, and took it home. LIFE IN THE MILITARY. Since he joined the mandatory military service from February 2015-October 2017 and was assigned to the Special Forces, Seung Gi showed some footage of his two-year military life. He shared how tough it was to do a 24-hour rigorous training of carrying a 230-kilogram boat on top of their heads while eating. But if you’re a fan of Seung Gi, you’ll know how proud he was of being in the Special Forces and how he was always teased by his co-stars in SBS’ variety show Master in the House by talking a lot about the military. “I think I did well in military,” he told his fans. "Going through the military made me grow as a better person now that I’m in my 30s. "I think all of you know that I talk a lot about military life. It made me more confident and physically fit." NEW PROJECTS. 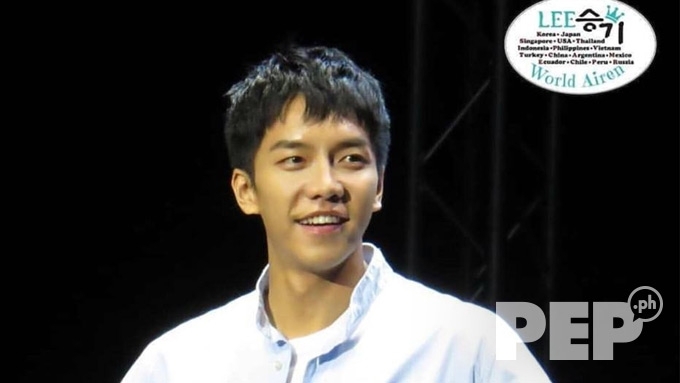 The Singapore fan meeting also gave Seung Gi's fans the opportunity to know more about his upcoming projects. It’s a fact that he's never had time off from the day he was discharged. He has been working really hard since his comeback. After his comeback drama, Hwayugi: A Korean Odyssey which is on its pilot week in ABS-CBN after Since I Found You, Seung Gi was busy with his return to Master in the House, the showing of his movie Goonghap or The Princess and The Matchmaker, advertisements (his recent was a Mercedes Benz SUV endorsement), hosting survival reality show Produce 48. He also has the upcoming spy-action drama Vagabond, which has a big budget of 25 billion won. The actor/singer/host said that if the fans enjoyed seeing him being intimate, Vagabond is 360-degree-turn, even if this project reunites him with his Gu Family Book leading lady, South Korean singer-actress Bae Suzy. Seunggi said there’s no kissing scene on the script he has read so far. Seung Gi said this is something his fans should look forward to in 2019. MORE HIGHLIGHTS. During the fan meeting, Seung Gi was treated by his Singapore Airen with a touching video which they personally made for him. They said that even when he was in the military, they continued to support him. They showed their tree planting project in honor of the Korean Superstar, the “Lee Seung Gi Trees” in Sengkang Riverside Park, Singapore. They also supported his movie Goonghap, which was released at the Korean Film Festival in Singapore. They also showed the video of his 2012 fan meeting in Singapore where a couple—who are both Airen—got engaged. Seung Gi then asked if the couple were present and personally asked them to go onstage. He said he was so happy seeing them happily married for five years and now with a two-year-old son. He requested for a photo op with the family, and signed the Polaroid picture right away. 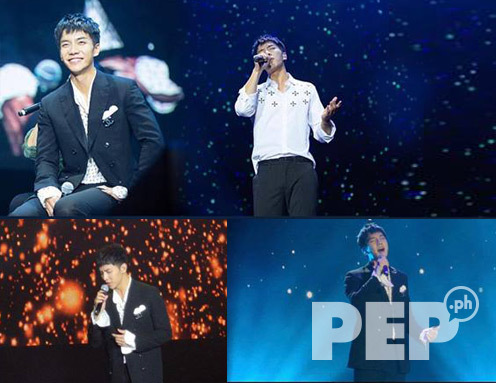 And of course, being one of South Korea’s best singers, Lee Seung Gi, who's also called the “Ballad King,” did not disappoint his fans. He opened the fan meeting with his debut song, “You’re My Woman” with the fans screaming and giggling, saying how handsome he was. By the time he sang his encore song, “Let’s Go On Vacation,” the security could no longer control the crowd. Some fans went very close to the stage dancing and singing with him. Seung Gi hyped everyone up with his performance! WORTHY OF FANGIRLING. The two-hour fan meeting was really worth the time and money. Seung Gi is funny and smart at the same time. His 14 years in the industry has not diminished his "Nation's umchina" (Nation's Little Brother) image. He’s still the humble, passionate and sincere maknae and hoedang that the viewers knew from his very first variety show 1n2D (2008-2012). Even the few seconds of high touch with him from the VIP seats was always something to remember because he always makes sure to look straight into people's eyes. 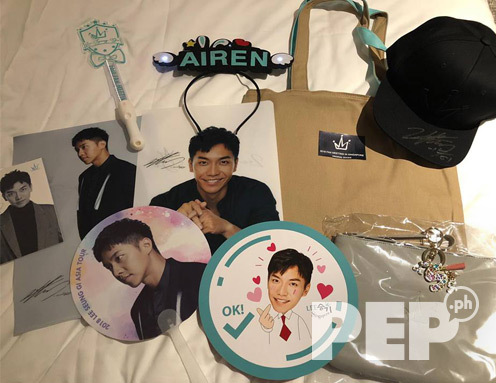 Definitely, Singapore Airen are lucky because Seung Gi made a promise that he will return next year for another fan meeting, an event that still remains a dream among the Philippine Airen. 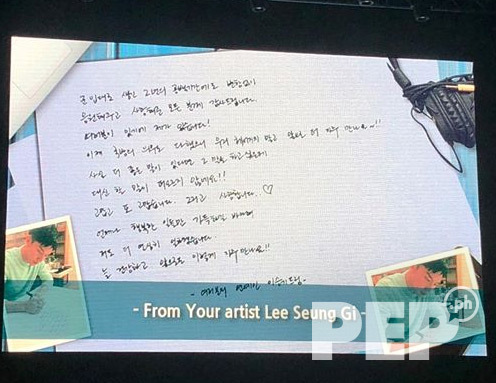 Before the fan meeting ended, Seung Gi's handwritten message for his fans was shown onscreen and was translated in English. It said, “Hi I am Lee Seung Gi. Did you all have a good time? I sincerely hope that everyone who came here had fun and unforgettable memories in a happy mood. I have been waiting for this moment today, for a long time. “Thank you all for supporting me and loving me as ever even there’s two years gap because of joining the army. “Because there is you, there is me! “Now, I fulfilled military duty, let’s not get separated and see each other more often from now on. “Actually, I’d like to say the words that if there’s any better word, but I cannot find the right word to express my mind. “Thank you, thank you and I love you. I hope you only have full of happiness all the time. And I promise, I will work even harder. “Everyone, stay healthy and let’s meet each other more often so like this! Because of the amazing experience Seung Gi always gives his fans, if I am given another chance, I would attend another fan meeting again in a heartbeat!